Raised in La Crosse WI, Doug graduated with a degree in Saxophone Performance from the University of Wisconsin at Eau Claire. He spent the 80’s in Seattle as a member of the Fred Radke Orchestra, and played with Gladys Knight and the Pips, the Four Tops, the Temptations, and many of the swing era greats including Steve Allen, Helen Forest, Frankie Lane and Frank Sinatra Jr. He was a founding member of the Jazz Police Big Band with whom he recorded two CD’s and wrote many of the charts they played and recorded. 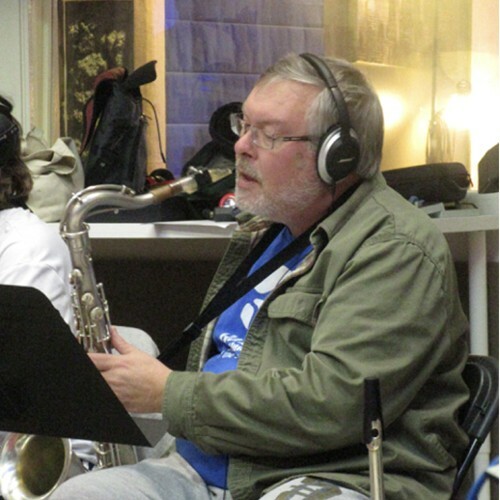 In 2008 he formed the ACME Jazz Company big band, committed to playing original tunes. Now in Colorado, Doug is very excited to be part of the Flatirons Jazz Orchestra.